Warning – todays post is going to include some unpleasant US history and a bit of a political rant on my part. If that doesn’t sound like something you want to read please skip todays blog and catchup tomorrow. If you do read it and have a reaction, I would like to hear from you in the comments or directly by email or other means of communication. I believe honest, rational, and respectful discussion of difficult topics is important. Yesterday we drove south and east from our place in Canton, Kentucky, to Stones River Tennessee. The primary site we were visiting was another Civil War Site: Stones River National Battlefield. You can explore the National Parks site to find out more specifics about why this battle was fought here, all the tactics and mistakes made by both sides, and the horrific details in terms of the loss of life. However, what I want to talk about is how I had the overwhelming feeling that much of the Civil War History, both at the time it was fought and today, can only be categorized as “Fake News.” And I don’t mean fake news in the way Trump uses it to label everything he doesn’t like. I mean in the literal sense that there were and are news stories printed which contained information which was knowingly and totally false. One example is the south reported they had given the Yankees a terrible trashing. True, the Yankees had lost a lot of lives but at the end of the battle it was the South who made a fast retreat from the area, abandoning the vital railroads and river ways they needed. This type of false reporting occurred throughout the war, a bit on both sides, but extensively in the South. Why? Because the south was in deep conflict over what they were trying to accomplish. They had seceded from the Union, declaring they no longer wanted to be part of the United States. Yet,they also wanted to claim they were proud Americans carrying on the traditions of our founding fathers. The South’s real hope was that a European power would side with them and force the north into negotiations so they could continue to be part of the United States, but with their most important concern protected: They wanted to be able to continue the practice of treating a whole class of people as property. This conflict existed from the very beginning of our country when the “great compromises” of the Constitution allowed the south to simultaneously claim slaves as property for purposes of ownership and as citizens for purposes of counting the size of their states. The false claims of victory after every lost battle did not fool anyone in either the North or the South of our country, but the hope was it would fool the French or British so they would think the South had a chance for victory. That same conflict of wanting it both ways continues to this day. I have seen places around the south where people are flying both an American flag and a Confederate flag. The Confederate flag was the flag of a people who did not want to be part of the country for which the American Flag stood. Some people, both then and now, say the South was fighting to preserve their way of life. However, by “way of life” they meant the right to own people as slaves and treat them as pieces of property. In addition the war was started not because Lincoln proposed to take away anyone’s slaves in the existing slave states, but, to prevent any further states from becoming slave states. The south knew that long term this was going to be trouble for them because they would lose their stranglehold on the Congress do to the equal number of Senators from Slave and non-Slave states. They not only wanted to keep being able to treat people as property where they currently lived, but wanted to expand the area where that right existed to include future states in the American West. I am sure my thoughts will not persuade anyone who does not already think this way. 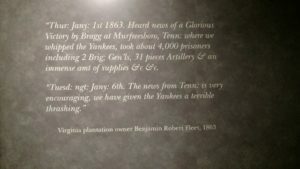 However, in visiting some of these southern museums, where everyone tries so hard to tap dance around the real issue of slavery, I just felt the need to speak my mind. If you have some thoughts of you own please let me know. Now, for part two. 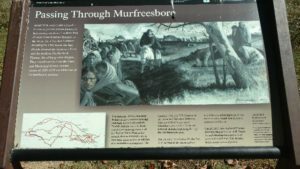 The other event memorialized at the Stones River site is the Trail of Tears National Historic Trail. If you think the history of our country’s treatment of slaves is the worst we have done, you may not be aware of this other part of our history. It is the story of an event that is the closest we have come to attempted genocide. The Cherokee people, who had done everything they could to fit in with, and stand up to, the Europeans who came to America, were forcibly moved from their homes in the Southeast. They were required to more to what was designated as Indian land in Oklahoma. The Cherokee had developed a written language, written a constitution, created a system of courts, and established their own newspapers, all based on what the white Americans were doing. However, the newcomers wanted the land being lived on by the Indians. So, under Andrew Jackson, the Removal Act was passed, requiring all Native People to leave the area of the original colonies. When they refused to do so, they were force out of their homes. The Supreme Court ruled in favor of the Cherokee but President Jackson, not unlike our current president, openly dismissed the ruling because he did not like the outcome. At least 15,000 Indians were forced on an 800 mile walk to move to their new land. Along the way many hundreds died. If you did not already know this story please take a few minutes to learn a bit more. Here is a link the NPS brochure, and one to a youtube reenactment, as well as a wiki page. Again, let me know if you have any thoughts on this. Finally, just a quick catch up. We did sample some Tennessee BBQ yesterday at a place purported to be the Best BBQ in Western Tennessee. It was good but I plan to compare it to a St. Louis BBQ and a Kansas City BBQ in the next week. We finally saw a Mississippi license plate and one for Vermont,so only about 6 states to go. Tomorrow we head north and west and should be seeing 1 or more national parks every day for a few days.